Feel free to discuss your rally & post any pictures, videos, gameclips, stream links, summaries etc. from round 1 in this thread. Good luck to all competing teams & drivers in the opening rally of season 7!! Stages are now open for 2 weeks in Greece! That was far from easy, I did it in one go and thought the stages would never end. A mixed event for me and came away reasonably happy although I`m sure my stage times aren`t too good at least I manged to finish. @Sloe wrote: Rally Greece complete. Wow you did all 12 in one go? Amazing job! I think I'm gonna split them into two runs as 12 is too much for me in one go. No rush to do it all at once this season though, remember each rally is up for 2 weeks! I'll be getting mine done over this week, as the next one will be a rush - on holiday for ten days from 12th June! I've been building myself up and I'm going to make a start on it tomorrow! I just want to take it steady and finish. Hopefully keep the (over) confidence under control as I know the Sierra wont hesitate to eat me alive. There is now one week left to complete Round 1, Rally Greece! Will anybody be able to challenge the early lead pace set by @VinceBartok? 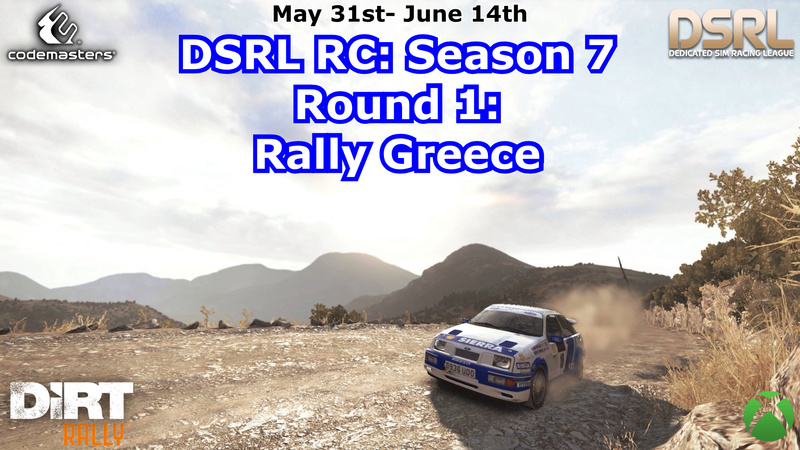 @EpilepticToast wrote: There is now one week left to complete Round 1, Rally Greece! Maybe you. Goliath is out unfortunately. Hope to get this in the bag in the next day or so. Struggling with a bad back issue this past week so have had to leave this on the back burner. Now, it's time to go to Le Mans for "Les 24H du Mans" !! Final Day to complete Round 1! Wow!! that was mega tough, probably the hardest rally we've had so far. I finished a long way off the leaders but I did finish Was in a battle with Hate for the first half of it but fell away in the second half. Last two stages were so difficult with my bonnet poking up making it difficult to see particularly in the uphill sections. I just made sure I brought it home and at the time was in 15th place. Don't imagine that will be my finishing position but happy enough to have completed it regardless. Round 1 of the season is now complete! Congratulations to VinceBartok for winning the opening rally of season 7! This rally was very tough on most cars and the repair crews were quite busy out there. BMW's filled most of the top 10 spots with teams Race Clutch & GT R Esport benefiting from rival team struggles and retirements. Season 7 is already spicing up! Championship standings will be posted in the coming days, next up we head to Sweden for round 2. It was a tough but fun rally. The last service area probably saved me from a DNF it was a nice suprise after I rolled the car on the previous stage. Most of my stages were ok it was just the long night stage where I had trouble and lost alot of time.